Soccer Darts, also known as Foot Darts, is the newest sporting craze for all ages. It's literally an impressive 15ft. bullseye target made of velcro where players kick a velcro covered ball to collect points. It's darts that you play with your feet! 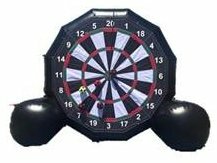 Both sides of the Soccer Darts inflatables are playable, meaning you can compete simultaneously. Be sure to add this game for endless hours of fun for kids and adults!